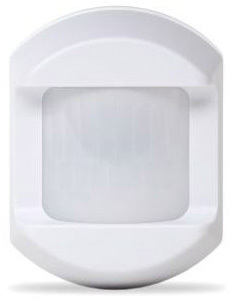 The Passive Infrared Motion Detector is a wall-mounted unit with wide-angle motion protection. It communicates with the control panel using the 345 MHz frequency. When set to High (HI) Sensitivity Mode, the PIR has a maximum range of 30 ft deep x 50 ft wide (9.1 m x 15.2 m). The PIR’s pet-immune feature can be set to tolerate animals up 55 lbs.